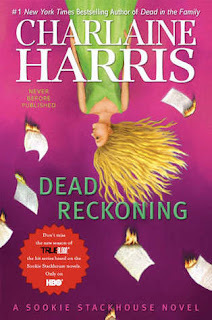 Sookie seems to be a magnet for trouble, and in Dead Reckoning, she more than proves this. The bar gets torched by a nasty fire bomb while she is working, and Sookie isn't sure who the culprit is. She and Sam must get to the bottom of things quickly as business is already bad, and they cannot afford to lose anymore customers. Meanwhile Pam and Eric seem to have something up their sleeve when it comes to their master's demise. Sookie joins them in their sentiment, but doesn't really want to be drawn into the actual plot. Of course she doesn't get that wish and quickly finds out there are many more who would seek to use her, as well as a potential betrayal that could change everything. While Dead Reckoning was better than the previous book, I still couldn't help but be disappointed. I prefer a book to be centered on one major issue with perhaps a few subplots to supplement. With supplement being the key word. This book just seemed to have threats coming from so many different directions as well as plenty of sideline happenings that it just seemed to muddle things. I just find it harder to get engrossed in a book when my attention keeps getting diverted due to this character's unknown plans for Sookie, or Pam's attempt to warn her of something to do with Eric. The list could go on and on. At times I really felt like I had a bad case of ADD as my attention kept wandering to previous statements and apparent machinations rather than what was currently happening. I'm finding the relationship between Eric and Sookie to feel almost wooden at this point. I really feel like they are doomed to fall apart at this point. Even if they don't, it's going to take a whole lot to get me really believing in them again. They hide so much from each other, and neither one seems to be the other's top priority. This has me scratching my head considering just how much time and effort has been put into their relationship in the first place. With only two books left how could Sookie find her HEA if she has to deal with the heartbreak of splitting apart with Eric during them. I really hope she doesn't end up with Bill, I just wouldn't find it believable, nor would I believe her falling head over heels for someone new anyway. So basically I'm really wary of the direction things seem to be heading, and while I hope I'm proven wrong, I just don't have much faith in a believable HEA for Sookie. I'll be honest and say that I am very glad this series will be ending with only two more books coming. Typically I am the person who gets devastated at a series ending, so my feelings about the Sookie series are a little surprising to me. I love the characters, and all the complex relationships between them, but for some time now the books have been lacking that special something that drew me to the series in the first place. I feel like so many things have been drawn out far longer than necessary while others have merely been glossed over. I fully intend to stick things out and finish Sookie's journey with her, but with the way things are looking now I have a feeling my reaction will be more of a sigh of relief that things are finally over, rather than any real satisfaction. I agree that I am glad that the series is ending. It seems to be falling apart and fast. I would like to see Sookie in a healthy relationship for once. @Alexis I'm not sure Sookie even knows how to be in a healthy relationship. Problem is that she can't be with humans bc she can read their thoughts, and that would cause way too many problems. So her choices are Vampires or Shifters as they are a little harder to read. Unfortunately none of the supernatural's lives are what you could consider normal. I'm hoping for a believable ending, but I'm not going to hold my breath.